This is an excerpt from our document, "Solving the Urban Runoff Problem: A Vision for the Urban Watershed - Ventura, California"
Over the past year, the Surfrider Foundation has been working on developing a vision for solving the urban runoff problem in the city of Ventura. We have used GIS to map the existing storm drain infrastructure and analyze aerial photos to identify potential opportunities within the watershed. Following site visits, we identified several areas in this subwatershed with potential for stormwater projects. This image shows opportunities for "low impact development" (LID) retrofit within the Sanjon drainage. First, there are several large parking areas (purple) that connect directly to the storm drain system. 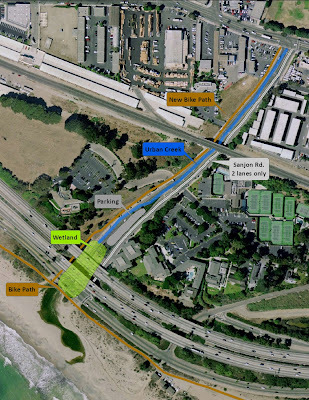 LID retrofit of these impervious areas could be achieved, effectively reducing a significant percentage of the urban runoff entering the system. Secondly, there are two large irrigated recreational areas (green); Cemetery Park and Cabrillo Middle School. In researching projects elsewhere, we found examples that demonstrate the feasibility of using storage cisterns to capture stormwater for later use on landscape irrigation. These open spaces also provide opportunity for constructed bioswales or infiltration trenches, landscaped with either native trees and shrubs, or grassy swales. These may be engineered to provide storage, retention and filtration for a specified design storm capacity, typically a one inch rainfall event. 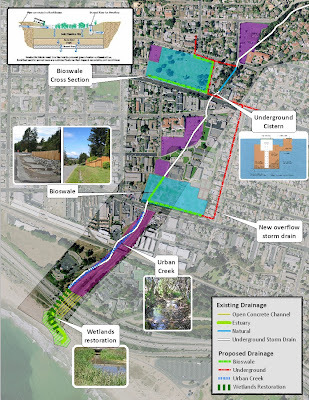 Finally, and perhaps most importantly, we have outlined an opportunity for Coastal Wetlands and Urban Creek Restoration within the lower Sanjon drainage. Coastal wetlands serve a well-documented function in the coastal zone. Ecosystem benefits include wildlife and fisheries habitat, as well as water quality enhancement in the final stages before discharge to receiving waters. In the case of Sanjon barranca, this function has been entirely eliminated through concrete infrastructure. Restoring the historic creeks and wetlands at this site would provide significant benefits. The process of “daylighting” creeks has been achieved elsewhere, and wetland creation and restoration has become a proven means of achieving water quality objectives. Our goal is to be a model for other communities of environmental responsibility, living in balance with our natural setting of coastline, rivers, and hillside ecosystems.